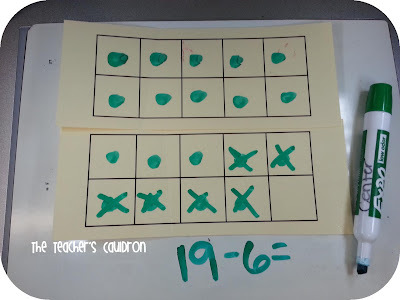 Apples, ice cream, ten frames (freebie! ), and word walls! What have we been up to this week so far??? Again, too bad I live in Florida - lol. It's really the only season I am TRULY jealous that other people have it. 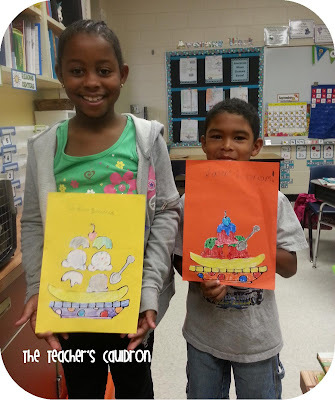 I've been using Alisha's math and literacy units..
My kids are having so much fun! And one of my kiddos took it upon himself to save some seeds from his apple that he got at lunch and he wanted to plant them...lol. Good thing I had soil on hand, because you just never know. haha! In other news, I've had TWO students pass their addition fact quizzes!! They are ready for their ice cream sundae party! I generally have our ice cream sundae party the first day of December (or the first day that we're in school in December). So now they have moved on to their subtractions...I bet by Christmas, they'll be in the multiplication pack! 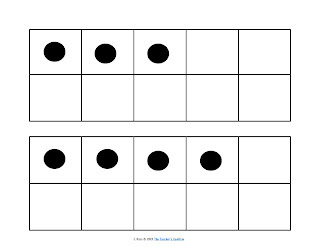 We've also been working on subtraction strategies....using ten frames...they're getting REALLY good at seeing these as visuals.. 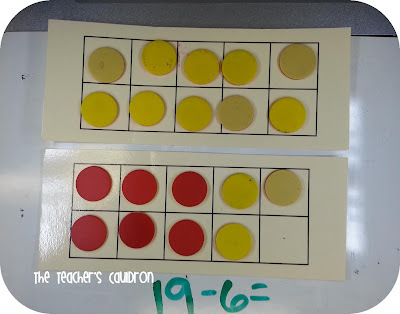 They used the double sided counters...and instead of taking them away, they just flipped them over. 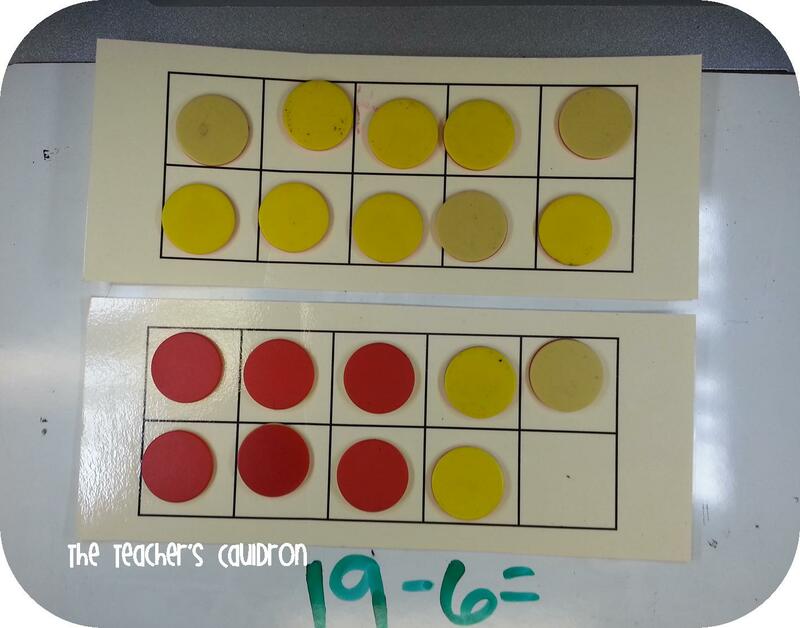 It was neat to see all the different ways the students took away six (or whatever number they working on). 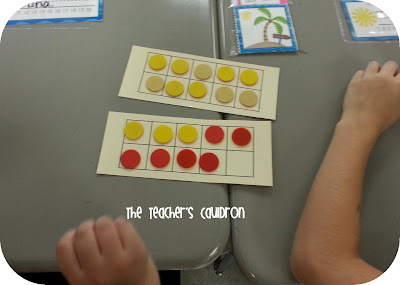 Here is what they did with just the ten frames (which are laminated) and a marker so they can practice how they could write them out on their own. Here you go- click the pics to get some frames! Also, I wanted to show you my new word wall words!! I put my alphabet under my chalkboard this year instead of above it. That way it could act as both an alphabet AND a word wall! After much seeking - I saw Lori's word wall (or rather she shared it with me) and I LOVED how the words were in configuration (the boxes). So that's how I did it too!! I L.O.V.E it! And I think I'm just sticking to sight words for this year. C) this is my downfall - the word wall, so baby steps...baby steps. I thought, maybe to keep me accountable for making my word wall be used EVERY week in a center, I could do a "Word Wall Wednesday" post - what do you think?? Something you'd be interested in? Anywhosit - time to go put the baby down..
HAVE to show you one of my new fave pics of B! P.s....I have something BIG "brewing" with some friends - can't wait to show you in a few days! 1. I'm jealous of everyone's fall season. 2. 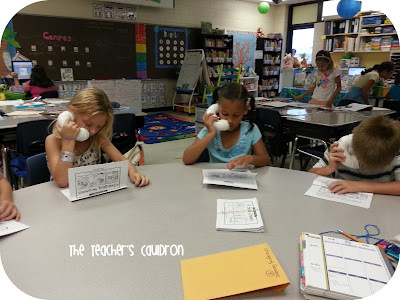 I'm using Alisha's literacy activities. L.O.V.E! 3. My children are thoroughly enjoying Spelling City. I guess your students know my name by now, huh? 4. I'm ready for an ice cream sundae party! 5. 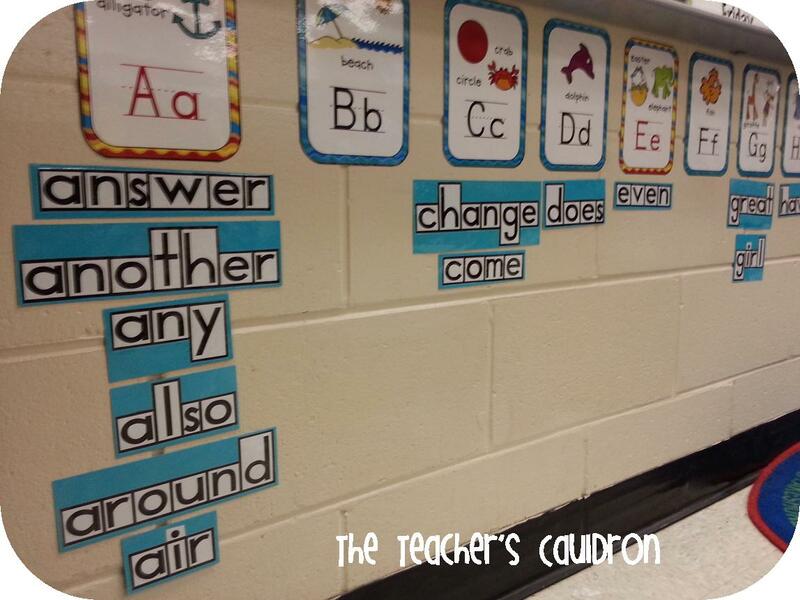 Our word walls ROCK! 6. 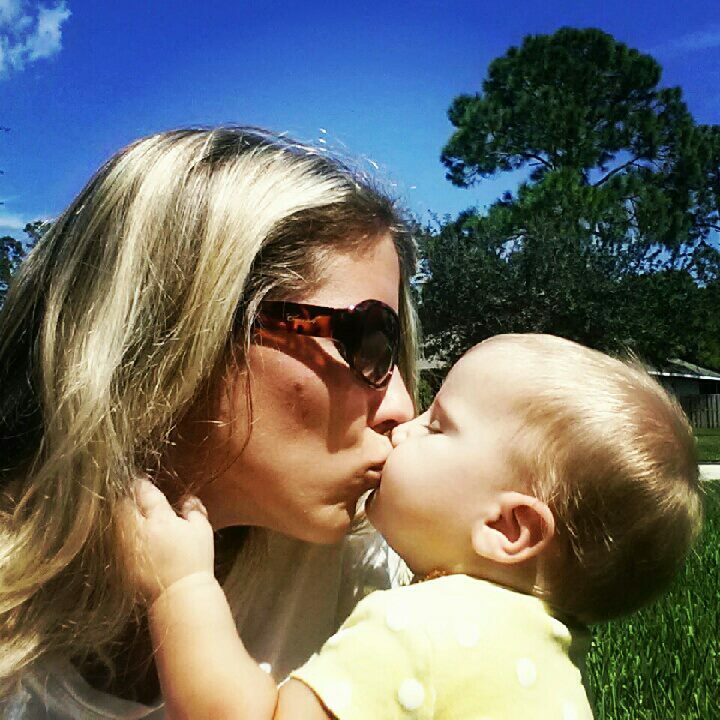 The picture of you and B is utterly adorable! We have so much in common! LOL! I love ALL things fall too. 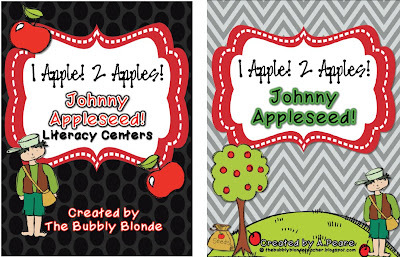 We are celebrating Johnny Appleseed in 5th grade too. We've been comparing and contrasting tall tales all week. It worked out perfectly! 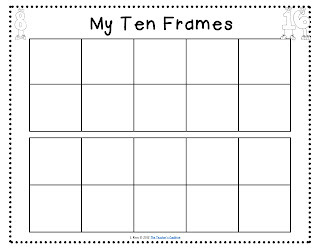 Great 10 frames! Thanks for sharing! That picture of you and B is so precious! 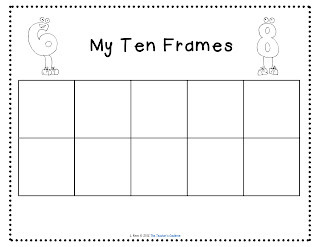 Thanks so much for the ten frame freebies! As another Florida blogger, I was so excited by the "cool" weather at 7:00am which quiky turned HOT! Love the picture of you and B!! 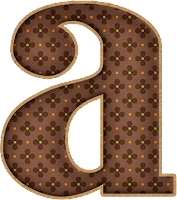 LOVE Learning A-Z!!! :-) Thank you for the ten frames! And that picture is adorable!!!! gorgeous picture! 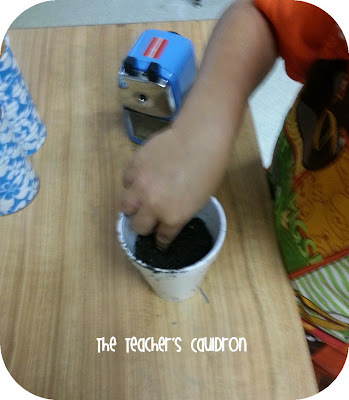 I think you are so sweet that you busted out your soil for some apple seeds. I would have been like...stick it in your pocket! 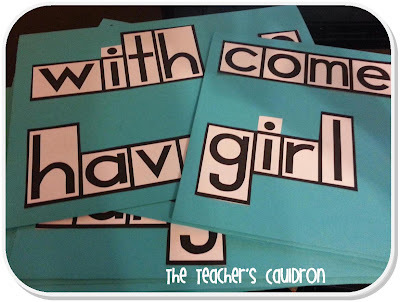 How did you make the word wall words? 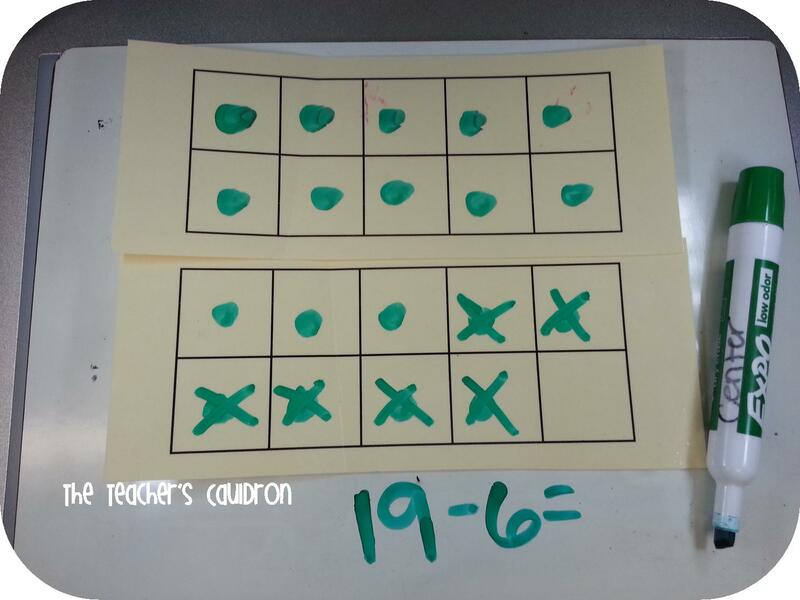 Thank you for sharing your ten frames! Going to use them to review numbers with my preschool group. Wow! Incredible and very innovative concept to encourage kids by organizing word wall for lern so many new thing with fun using such kind of frames. I love it and like pics of your pretty word wall. Currently I am CV writer and counselor and providing professional Accountant CV help - https://www.cvfolks.co.uk/accountant-cv/ at CV Folks but being as a past teacher, I loved your ideas to identify student’s inner talents with avenging such kind of creative activities which can increase their learning abilities.